How Early Can Kids Enjoy Reading? Home > Tools & Techniques > How Early Can Kids Enjoy Reading? Many parents ask the same question: "How early can my child learn to read?" Not surprisingly the answer isn't exactly cut and dry. Reading isn't something that starts at a certain age. Some children can learn their ABCs by their first birthdays; others don't learn theirs until they are three or four. Like crawling, walking, and tying a shoelace, being able to read is dependent upon the readiness of the boy or girl. With that being said, all parents can start an interest in and love for reading in their offspring from the time the child is born. Research has shown that infants enjoy being introduced to books, even if they don't know or understand what's being read and shown to them. If your child sees plenty of books, magazines and other reading items around his or her house from the time he or she is born, the notion of reading will seem perfectly acceptable. When kids grow up around books, there's a better chance that they'll think of books as "friends". Are you an avid reader? If not, it may be tough to convince your child that you believe reading is important. Fortunately, it's never too late for you to begin. Even if you just enjoy perusing cookbooks from beginning to end or perusing blogs on a daily basis, do it in front of your son or daughter so he or she can see how much you love to read. Reading to your child promotes an interest in the process; it will also make your son or daughter feel that reading is a lovely, warm, enjoyable act. Pick a special time when distractions are at a minimum (such as before bed) and read a story or two aloud to your youngster. Afterwards, talk about the book and what "could" have happened, coming up with alternative endings for fun. Do you read to your child with expression and excitement? 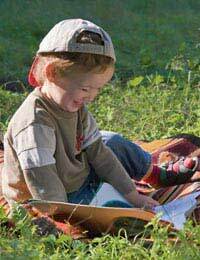 By infusing all the tales your child hears with enthusiasm, you'll make him or her think, "Hey! This is tons of fun! I wish I could read, too!" Periodically talk with your child about something you've read, perhaps in the newspaper or a magazine. That way, he or she can understand that being literate has an intrinsic value. Make sure to add, "When you learn to read, you'll be able to find out tons of information about subjects you love." Kids have a natural creative "bent", so why not use that to fuel a lifelong love of reading? Sit down together on a weekend afternoon and spend 30 minutes to an hour writing and illustrating a book composed by the two of you. Not only is this a great way to pass the time, it's also a terrific means of helping your child learn to read. If you start to suspect a problem in your child's language acquisition ability, make an appointment to see a specialist so you can rule out any learning disabilities or physical handicaps. By taking action immediately, you'll be making certain that you can appropriately help him or her to become literate. Even though you might get frustrated by your child's temporary lack of interest in or inability to learn some aspect of reading, put on a happy face. Never berate your son, daughter or student for being "slow" or "lazy"; doing so will only make him or her less likely to want to continue. The more optimistic you are, the better the chances that he or she will read earlier rather than later in life. Could Better Nutrition Help Your Child Learn to Read? Cookbooks: A Great Way to Teach Reading, Maths, and Science!